I have two questions that i would like to ask about the logic analyzer function on the Analog Discovery 2. 1. With the rating of 100Mhz logic analyzing sampling rate, what is the maximum frequency can I capture? What about the spi frequency of 20Mhz? I moved this thread to the scope and instruments section where more experience AD2/Waveforms engineers look. Use the record mode to capture more data than the device buffer at a maximum rate of about 1MHz. What should the data be? Doen't data need two wires one is MOSI the other is MISO? I also have data ready pin, so I will create a separate channel for it, right? 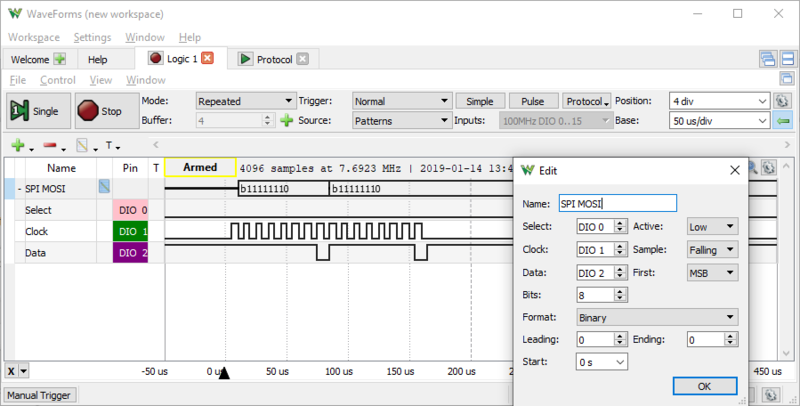 If you are wanting to view both the MOSI and MISO data lines, it is my understanding that you will need to create two separate SPI channels in the logic analyzers, with the data set to MOSI and the other set to MISO. If you have a separate data ready pin, you would want to create a separate input for it; you can then have the logic analyzer acquistion be triggered off of it whether you choose to attach the data ready pin to one of the external triggers or be one of the digital inputs. I don't know what device you are interacting with so I can't speak much towards the reset, but presuming it is a active low reset for the external device I would probably tie the pin to a logic high state/use a pull-up resistor. 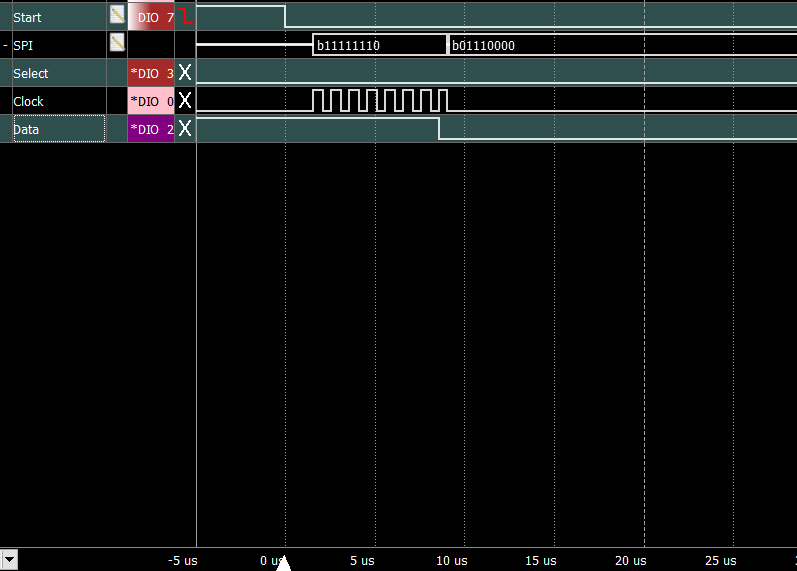 Hi, I have setup the SPI logic analyzer for the SPI communication between arduino and TI ADS 1256. We know that the Data line (MISO) should only be triggered from the first rising edge of the clock. But the logic analyzer interprets the data as if the data line (MISO) from this logic analyzer appears to pulse before the clock. I also use oscilloscope to probe the timing between the clock and the data line and it matches with the signal pulses on the logic analyzer, but why the logic analyzer interpret the data as follow? The setup is Active LOW, Sample RISING,First MSB, format BINARY, no leading or trailing, start at 0 s.
Your SPI signal is active on rising edge, data bit changes on rising clock edge, so use in the Logic Analyzer sample on falling edge to interpret it correctly.